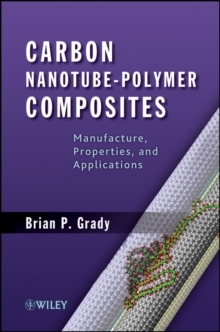 Providing a much-needed and thorough overview of polymers in the carbon nanotubes (CNTs), Carbon Nanotube-Polymer Composites provides a fundamental understanding of achievements in the field and highlights key studies that have had significant impact. The author summarizes widely scattered information (8,000 journal papers) into one accessible resource, complemented by references to key papers for readers wanting more in-depth information. The text comprehensively examines CNT-polymers from synthesis to manufacturing and applications, making this a valuable tool for polymer scientists and engineers, chemists, physicists, and materials scientists.